BRIDGETOWN – From tourism-dependent nations like Barbados to those rich with natural resources like Guyana, climate change poses one of the biggest challenges for the countries of the Caribbean. “We are giving high priority to redressing the fallout from climate change,” the bank’s president Dr. Warren Smith told journalists at a press conference here recently. For the first time, the bank has accessed a US$33 million credit facility from Agence Française de Développement (AFD) to support sustainable infrastructure projects in select Caribbean countries and a 3 million euro grant to finance feasibility studies for projects eligible for financing under the credit facility. “At least 50 percent of those funds will be used for climate adaptation and mitigation projects,” Smith explained. “Why is this such a big deal? The Caribbean is facing a climate crisis, which we need to tackle now – with urgency,” Smith said. 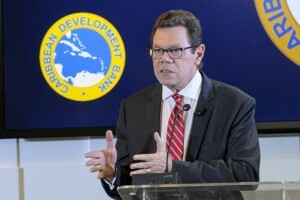 The financing options outlined by the CDB president would no doubt be welcome news to Caribbean countries in the wake of United States President Donald Trump’s recently proposed budget cuts for climate change funding. The proposed 2018 federal budget would end programmes to lower domestic greenhouse gas emissions, slash diplomatic efforts to slow climate change and cut scientific missions to study the climate. The budget would cut the Environmental Protection Agency (EPA) funding by 31 percent including ending Trump’s predecessor Barack Obama’s Clean Power Plan – the Obama administration’s plan to reduce greenhouse gas emissions from power plants. At the U.S. State Department, the budget proposal eliminates the Global Climate Change Initiative and fulfills the president’s pledge to cease payments to the United Nations’ climate change programmes by eliminating U.S. funding related to the Green Climate Fund and its two precursor Climate Investment Funds. The Green Climate Fund is the U.N. effort to help countries adapt to climate change or develop low-emission energy technologies, and the Global Climate Change Initiative is a kind of umbrella programme that paid for dozens of assistance programmess to other countries working on things such as clean energy. The proposal would also cut big chunks out of climate-related programmes of the United States Agency for International Development (USAID). The USAID is the American agency through which the countries of the Caribbean get a lot of their funding for climate change adaptation and mitigation. “We would be foolish to have taken a lead role in getting the world to move on climate, to put innovation at its core and then walk away from that agenda,” Dr Ernest Moniz said on CNN. “Some of the statements being made about the science, I might say by non-scientists, are really disturbing because the evidence is clearly there for taking prudent steps. “I would not argue with the issue that different people in office may decide to take different pathways, different rates of change etc., but not the fundamental science,” added Moniz, who was instrumental in negotiating the Paris Climate Agreement. Throughout his election campaign, Trump consistently threatened to withdraw the United States from the Paris Climate deal. Moniz, a nuclear physicist and former Secretary of Energy serving under President Obama, from May 2013 to January 2017, said he would wait and see how this develops, but said of the threat to pull out of the Paris Climate Agreement, “obviously, that would be a very bad idea” noting that every country in the world is now committed to a low-carbon future. Since being sworn in as president in January, Trump’s administration has been sending somewhat mixed signals about climate change. While Trump himself has described climate change as a hoax, he also said he had an open mind toward efforts to control it. Caribbean countries, meanwhile, are watching with keen interest the developments in the United States. Executive Director of the Caribbean Regional Fisheries Mechanism (CRFM) Milton Haughton said fisheries is one of the industries being impacted by climate change. “Climate change, sea level rise, ocean acidification and disaster risk management are major challenges facing the fisheries sector and the wider economies of our countries,” Haughton said ahead of a two-day meeting in Kingston to discuss measures for adaptation to climate change and disaster risk management in fisheries as well as the status of and recent trends in fisheries and aquaculture in the region. “These issues continue to be high priorities for policy-makers and stakeholders because we need to improve capacity, information base and policy, and institutional arrangements to respond to these threats and protect our future. “At this meeting, we will be discussing the USA-sponsored initiative to provide risk insurance for fishers, among other initiatives to improve and protect the fisheries sector and ensure food security,” Haughton added.